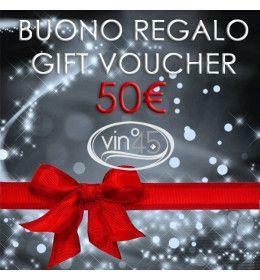 The Gift Certificate of 50€ is a wonderful gift that allows the widest freedom of choice for those who will receive it. It is valid for all the products in our catalog and can be integrated as desired by the beneficiary. The Gift Certificate is available for amount of 25€, 50€, 75€ and 100€. WHAT IS IT The Gift Certificate is a coupon of the value you selected that is used by the beneficiary as a "discount" form when purchasing any product within our site. HOW TO BUY AND HOW YOU RECEIVE IT The Gift Certificate is purchased as any other product on our site. Once purchased, you will receive both the receipt of your payment from your bank account and the order confirmation from us. Received your order, we will process it and we will send you the Gift Certificate by email (at the same address you used to sign up to our site). From that time, the code can be used. Gift Certificate is not personal , so you can give it away and the beneficiary can use for himself. The code we will send you is unique and must be spent in full in 1 single shopping session . The Gift Certificate is valid for 1 year from the date of issue (code and date will be reported on the document we will send). HOW TO USE IT The Beneficiary of the Gift Certificate, in order to use it, must sign in to our site. The choice of products is completely free and irrelevant to the use of the Gift Certificate. When checking out the beneficiary has to enter the Gift Certificate code into the Voucher field and the system will automatically deducted the Gift Certificate value from the amount of the shopping cart. Many Gift Certificates can be used for the same shopping session: they need to be entered one at a time and confirmed in the voucher field. If properly inserted, the system will show them all before the check-out. The Beneficiary may purchase products for an amount equal to or higher than the Gift Certificate: in case the purchased amount exceeds the Gift Certificate, he has to pay the balance due using the preferred payment method. The Gift Certificate must be spent for its entire amount in 1 single shopping session; no form of refund, cash conversion or other form of credit is possible. The choice of type of delivery and any promotions in progress are not affected by the use of the Gift Certificate. The Gift Certificate is a coupon of the value you selected that is used by the beneficiary as a "discount" form when purchasing any product within our site. The Gift Certificate is purchased as any other product on our site. Once purchased, you will receive both the receipt of your payment from your bank account and the order confirmation from us. Received your order, we will process it and we will send you the Gift Certificate by email (at the same address you used to sign up to our site). From that time, the code can be used. Gift Certificate is not personal, so you can give it away and the beneficiary can use for himself. The code we will send you is unique and must be spent in full in 1 single shopping session. The Gift Certificate is valid for 1 year from the date of issue (code and date will be reported on the document we will send). The Beneficiary of the Gift Certificate, in order to use it, must sign in to our site. The choice of products is completely free and irrelevant to the use of the Gift Certificate. When checking out the beneficiary has to enter the Gift Certificate code into the Voucher field and the system will automatically deducted the Gift Certificate value from the amount of the shopping cart. Many Gift Certificates can be used for the same shopping session: they need to be entered one at a time and confirmed in the voucher field. If properly inserted, the system will show them all before the check-out. The Beneficiary may purchase products for an amount equal to or higher than the Gift Certificate: in case the purchased amount exceeds the Gift Certificate, he has to pay the balance due using the preferred payment method. The Gift Certificate must be spent for its entire amount in 1 single shopping session; no form of refund, cash conversion or other form of credit is possible. The choice of type of delivery and any promotions in progress are not affected by the use of the Gift Certificate.